I have to call it a “UFO” since it was definitely a “flying object,” but it was also “unidentified.” The object was moving so fast that its image is blurred in my photo. 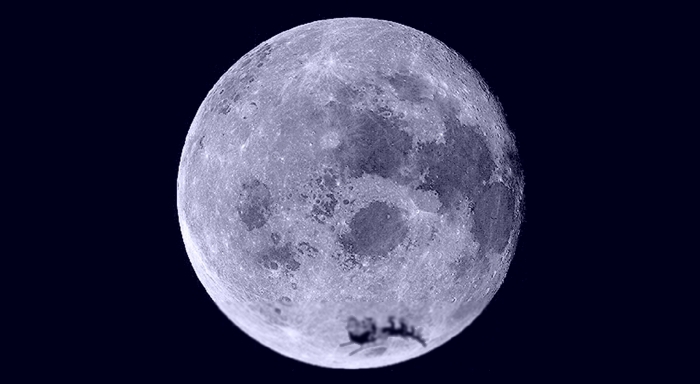 You can see something that might be a sleigh moving past the lower edge of the Moon. But it could also be a flock of birds, or maybe even some weird shaped cloud. Santa’s sleigh is not an easy thing to spot for several reasons. First and foremost, it has no flashing lights. The FAA requires lights on all aircraft, but Santa obviously gets a waiver. Second, the sleigh is not that large an object, even with 8 or 9 reindeer attached. Third, he only flies one night every year, and the night sky in December is often cloudy. My first thought was it couldn’t be Santa’s sleigh, since it wasn’t Christmas Eve. This was December 23rd. What would Santa be doing up there so early? Exercising the reindeer? Practicing a dry run? Just out for a joy ride? Then I realized that, when it’s December 23rd here, it’s December 24th west of the International Date Line, and nighttime at that location on the globe. So he would already be on the job delivering gifts in northern Asia. If you’ve ever followed NORAD’s Santa Tracker on Christmas Eve, you’ll see that he does indeed start at the International Date Line and work his way west from there. Of course, as Dec 24 steadily advances westward, he needs to move fast to keep up with the darkness of night and remain hidden from those who are still awake. That requires a speed of at least 460 m/s (about 1000 mph)!